1913: Launched by Crabtree & Co Ltd, Gt. 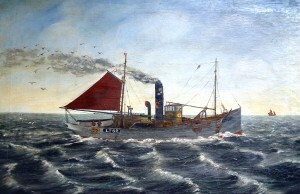 Yarmouth (Yd.No.146) for H. R. Broadley Ltd, Lowestoft as GLEN HEATHER. 7.1913: Completed (Henry C. Broadley, manager). 29.7.1913: Registered at Lowestoft (LT62). 9.1915: Requisitioned for war service as an A/S net drifter (1-6pdr HA) (Ad.No.1866). Based in Aegean Sea. 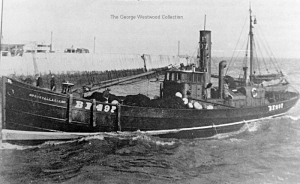 By 12.3.1919: Returned to owner at Lowestoft (H. R. Broadley Ltd, Lowestoft). 28.1.1920: Disabled with nets in propeller. 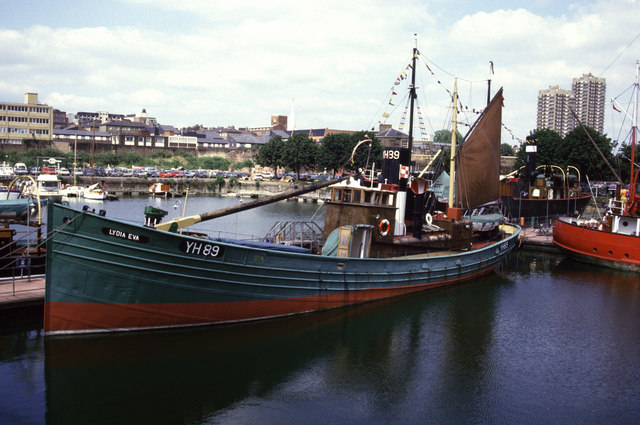 Steam trawler EXETER (GY426) connected and delivered Lowestoft. 22.7.1931: Sold to George Mitchell, Lowestoft (managing owner). 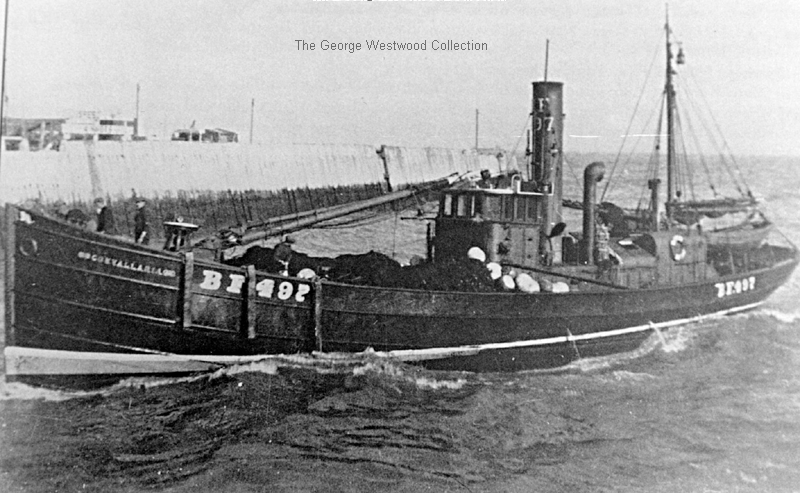 1930s: Seasonal white fish trawling from Padstow and Fleetwood (William Head, managing agent). 21.11.1939: Requisitioned for war service as a minesweeping drifter (P.No.FY.556) (Hire rate £27.13.6d/month). 6.1940: Based Swansea (Ty/Sk. S. J. Catchpole RNR). 1942: Based Milford LL sweep drifter (Ty/Sk. F. A. Nunn RNR). 11.1944: Employed on miscellaneous Naval duties. 1948: Sold for breaking up. 22/02/2011: Page published. 3 updates since then. This entry was posted in Drifter/Trawler, Seasonal Visitors, Steam Trawlers, Steamers (Picture) and tagged Drifter/Trawler, No Fleetwood owners, Seasonal on February 22, 2011 by Fred Smith. 1930: Launched by King’s Lynn Slipway Co Ltd, King’s Lynn (Yd.No.251) for Henry James Eastick, Gorleston as LYDIA EVA. Towed to Gt. Yarmouth for machinery fit. 23.7.1930: Registered at Yarmouth (YH89). 26.7.1930: Mortgaged to Barclays Bank Ltd, City of London (A). 8.1930: Completed (Built at King’s Lynn by Tyneside labour due to industrial action at Crabtree & Co Ltd, Gt. Yarmouth). 1930s: Seasonal trawling from Fleetwood (Lowestoft Fish Selling Co Ltd, Lowestoft, managing agents). (Fished more successfully as a trawler as herring drift nets damaged by bluff bow. Also used as a herring carrier). 11.10.1937: At Yarmouth landed 221 crans of herring. 12.1938: Last landing at Yarmouth. 21.10.1939: Sold to South Caernarvonshire Yacht Co Ltd, Pwllhelli for £800 under mortgage (A). 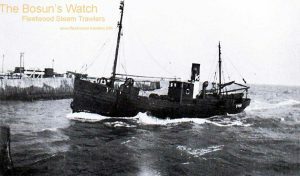 Converted and re classified as a salvage vessel for Air Ministry contract associated with Pwllheli and other West coast Bombing & Gunnery Ranges. 18.1.1940: Mortgaged to Barclays Bank Ltd, City of London (B). 1940: South Caernarvonshire Yacht Co Ltd t/a Western Marine Craft Ltd, Pwllheli. 10.12.1942: Requisitioned for war service with Ministry of Aircraft Production (Hire rate £50.0.0d/month). 27.5.1943: Compulsorily acquired by M.O.W.T (Ministry of Aircraft Production). Further converted at Abersoch for cargo with strengthened main mast and derrick ((John Deheer Ltd, Grimsby (Pwllheli), manager). 4.9.1943: Yarmouth registry closed except as far as relates to mortgage (B). “Registry no longer required”. 1943-1945: Based Abersoch, Pwllheli and Ilfracombe. 1945: Transferred to Maryport, attendant to Mawbray Bombing Range. 1.4.1947: Sold to Air Ministry, London. Registered at London as WATCHMOOR. 1948-1952: Based Milford, Watchet, Appledore, London, Cardiff and Pembroke Dock. 21.12.1965: Proposed to transfer all MOD (Air) vessels to MOD (Navy). 1966: Rebuilt on Tyneside with new wheelhouse and new boiler by Stockton Chemical Engineers & Riley Boilers Ltd, Stockton on Tees (Boiler made 1961). 1.4.1966: Transferred to Director of Marine Services (DMS), Bath. British registry closed. Based Pembroke Dock, crew on D606 articles. 6.1966: In Cardigan Bay experienced engine problems. EMPIRE NETTA (290grt/1945) connected and delivered Holyhead. 1967-1968: Various duties as required by DMS. 1968: Declared surplus to requirements. De-equipped and laid up at Pembroke Dock. 1969: Sold to Turner & Hickman Ltd, Glasgow. 1972: Sold to The Maritime Trust. Docked and overhauled in Penzance by Holman & Sons Ltd.
1972: Registered at Yarmouth as LYDIA EVA. 1973: Rebuilt by George Overy Ltd, Lowestoft. 1973-1978: Following partial restoration at Lowestoft, static display at Gt. Yarmouth. 1978-1986: Static display at St. Kathrines Dock, London. 1986-1990: Exhibition closed. Laid up in West India Dock. 1989: Lydia Eva Charitable Trust formed. 1990: Sold to Trust for £1.00. 30.6.1990: Arrived Gt. Yarmouth in tow of HECTOR READ (65grt/1966). 2000: Slipped at Lowestoft but on survey found to need extensive shell plate renewals. Laid up in Lake Lothing. 12.2006: Application for Heritage Lottery Funding successful (£839,000). 1.3.2007-18.3.2008: Slipped by Small & Co (Marine & Engineering) Ltd, Lowestoft for survey and 60% shell plating and some frame renewals, deck relaid, electrical installation update, start of machinery overhaul. 9.2008: Towed to Gt. Yarmouth for Great Yarmouth Maritime Festival. 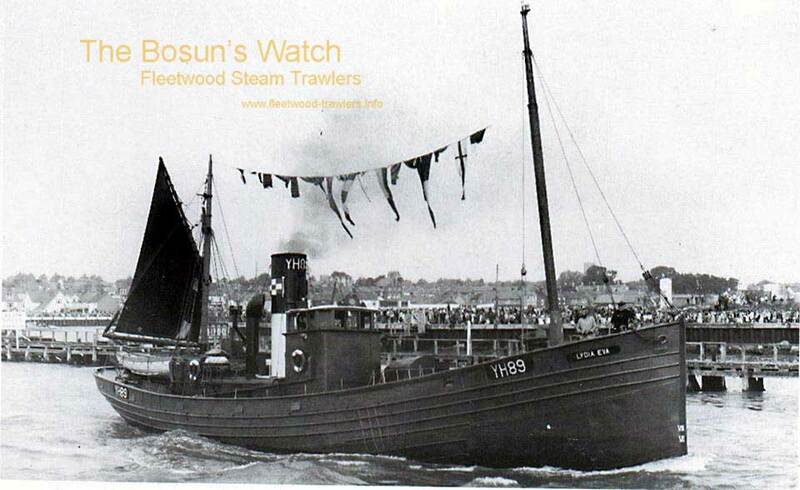 10.2008-20.5.2009: At Small & Co (Marine & Engineering) Ltd, Lowestoft to complete boilerwork, museum and after cabin fit out. 3.2009: In steam, successful boiler trial. 20.5.2009: Returned to Gt. Yarmouth. 12.2009: Arrived Lowestoft from Gt. Yarmouth under tow. 12.2009-2010: Continued refurbishment by Small & Co (Marine & Engineering) Ltd, Lowestoft. 3.2010: Successful steaming trials in Lake Lothing. 15.5.2010: Steamed to Gt. Yarmouth. Open to visitors. 14.12.2010: Steamed to Lowestoft for further work by Small & Co Ltd. Laid over adjacent to Laundry Lane slip. 13/02/2011: Page published. 5 updates since then. 09/11/2018: Removed FMHT watermarks from images. This entry was posted in Drifter/Trawler, Seasonal Visitors, Steam Trawlers, Steamers (Picture) and tagged Drifter/Trawler, No Fleetwood owners, Seasonal on February 13, 2011 by Fred Smith. 1914: Launched by Livingstone & Cooper Ltd, Hessle (Yd.No.154) for John Thomas Cullen Salmon, Gt. Yarmouth as THE MAJESTY. 22.9.1914: Registered at Yarmouth (YH25). 10.1914: Completed for The Crown Steam Drifters Ltd, Gt. Yarmouth (George Herbert Hansell, manager). 4.1915: Requisitioned for war service as an A/S net drifter (1-6pdr) (Ad.No.1033). Based Larne. 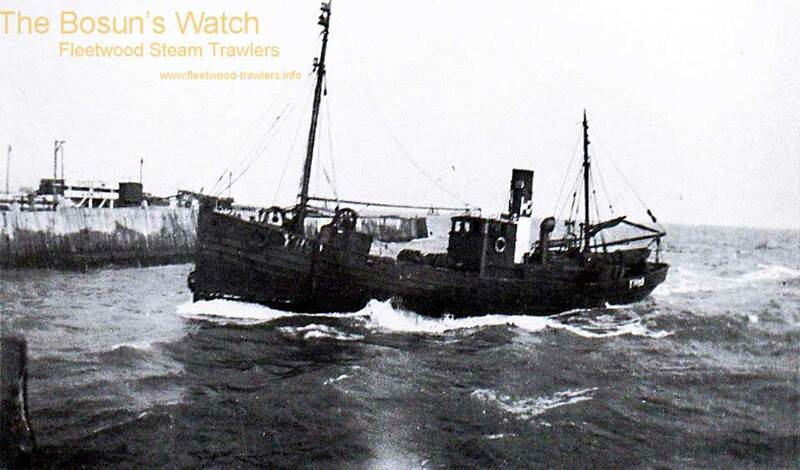 1920s: Seasonal trawling from Fleetwood. 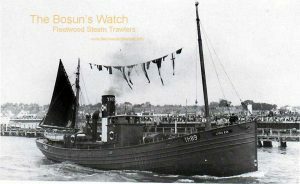 7.6.1924: Sold to Harry Baxter (16/64), Lowestoft; Edward Catchpole (16/64), Kessingland; Charles William Dance (16/64) and John Utting (16/64), Lowestoft (Edward Catchpole, manager). 17.6.1924: Registered at Lowestoft (LT65). 16.7.1924: Registered at Lowestoft as FELLOWSHIP (LT65). 1930s: Seasonal trawling from Padstow and Fleetwood (Alex Keay, managing agent). 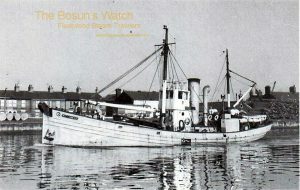 6.3.1931: Off Padstow, broke rudder. 6.3.1931: Damaged in collision with OCEAN RAMBLER (YH727) in Padstow Harbour. 21.8.1933: At Fraserburgh with damaged propeller. 21.8.1933: Connected to BOY SCOUT (LT17) disabled and delivered Lerwick. 2.8.1938: At Lerwick with damaged propeller. 1939: R. Catchpole, Lowestoft appointed manager. 16.11.1939: Requisitioned for war service on examination service (Hire rate £27.0.0d/month). 1940: To Mediterranean as a minesweeping drifter (Hire rate £27.13.6d/month). Based Suda Bay (Ty S/Lieut. S. Barrie RNR). 7.1941: Based Suez Canal area with M/S Group 40 (Ty S/Lieut E. Saul RNVR). 24.10.1941: Compulsorily acquired by M.O.W.T. 26/01/2011: Page published. 2 updates since then. 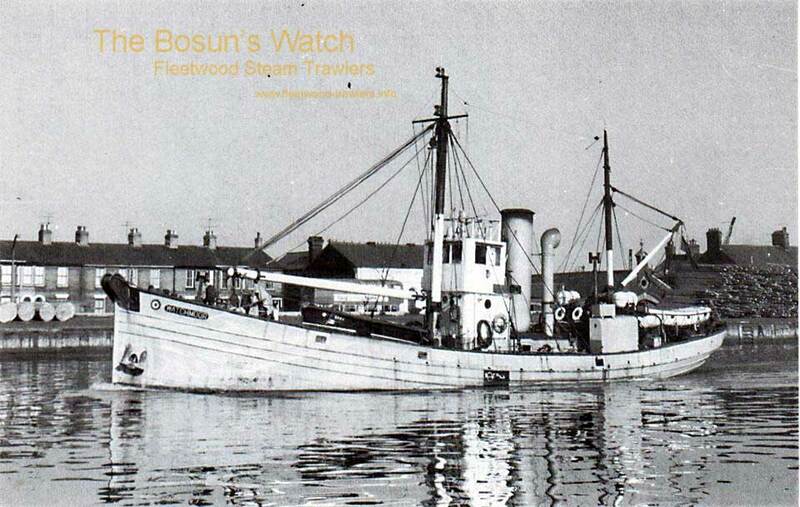 This entry was posted in Drifter/Trawler, Seasonal Visitors, Steam Trawlers and tagged Drifter/Trawler, No Fleetwood owners, Seasonal on January 26, 2011 by Fred Smith.